The management team at an ambitious digital brand strategy and design agency is jumping for joy after picking up a succession of new contracts. Newcastle-based JUMP offers the full range of creative design and digital commerce services to a growing roster of regional and national clients, including the National Trust, Newcastle University, Northumberland development company Arch and the Newcastle Motor Show. After developing and launching the well-received Get Into Newcastle website for the city’s Business Improvement District company NE1 earlier in the summer, JUMP has now won two contracts with Newcastle Upon Tyne Hospitals NHS Foundation Trust. A bespoke website and database solution for Newcastle Upon Tyne Hospitals NHS Foundation Trust that shows the advantages of the staff benefits scheme to all NHS employees will now be built by the JUMP team, while at the other end of the scale, they have also taken on a bespoke digital platform for the online tickets sales for People’s Theatre in Newcastle. A new designer and two graduates have just been taken on by JUMP to help manage the agency’s increasing workload, taking its headcount up to 20 people, while former head of development Kris Consadine has returned to JUMP as its new project manager with a brief to further improve its ways of working. 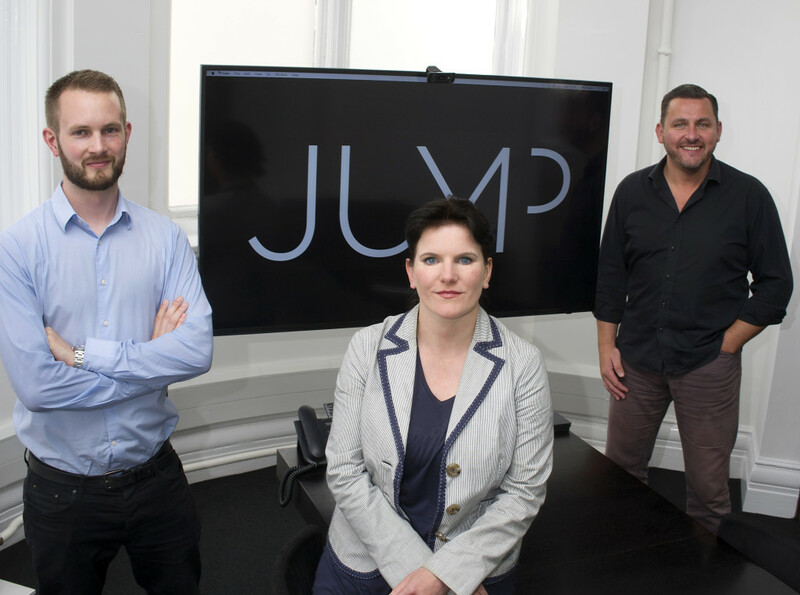 Founded in 2007 by graphic designer Lucy Batley and software developer Robert Brown, JUMP has developed particular expertise in the industrial/commercial and education sectors, and is working towards doubling its turnover by 2018 by attracting both new and larger clients. Its business plans are being supported by an investment from the Finance For Business North East Growth Fund that it secured last year through NEL Fund Managers, which is acting as the growth capital it required to fund its expansion plans. Lucy Batley says: “Having the Growth Fund capital to hand has enabled us to make progress far more quickly than would otherwise have been possible, and we’re really feeling the benefits of it right across our operations. “As a team, we’re growing in confidence, and the quality of work that we’re producing is leading to us being invited to put our ideas to an ever-greater range of companies. “Benefits Everyone and Newcastle Upon Tyne Hospitals NHS Foundation Trust are both high profile projects of national importance that will help deliver the Trust’s drive towards attracting and retaining skills in the North East, and we’re excited at the opportunities being involved with them both offers us. “JUMP is a truly full service brand, design and digital offering that we don’t believe is matched anywhere else in the North East, and we’re growing the size and skills base of the team to ensure we can effectively manage all the work that’s coming through our doors. !